This is a type of Celtic wedding ceremony. The couple stands together with wedding guests forming a circle around them. No clergy was needed, the couple simply pledged themselves and had their hands gently bound together with a cord or strip of cloth or tartan. The expression “tying the knot” may have come from the their hand-fasting ceremony. Handfasting was originally a trial marriage contract that lasted for a year and a day; if it didn’t work out, the couple simply went their separate ways. 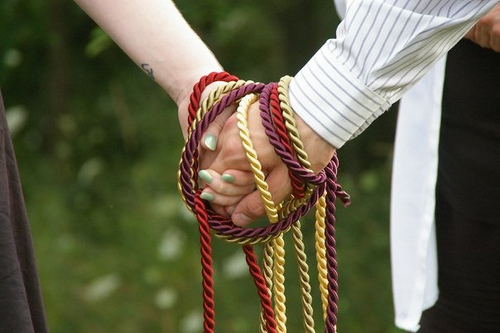 Nowadays handfasting can be incorporated into a Christian or civil ceremony as part of a connection to our Celtic culture.